At the end of the day homebred cows from the East coast remained in the middle of the ring. Last year at the International Ayrshire Show, Palmyra Berkely P Ruth-ET’s day ended with Intermediate champion. But this year, Ruth took home a banner as the Grand Champion of the International Ayrshire Show. The homebred Senior 3-year-old owned by Evan Creek of Hagerstown, Md., had the judges’ eye from the moment she stepped on the colored shavings. “When this 3-year-old came in the ring, I asked (associate judge) Kurt if anything was going to beat her. He said, ‘I don’t think so,’” announced judge Allyn Paulson of Arlington, Wis. shortly after making his selection. “Three calves and she calves back every eleven months. That’s a pretty good rig,” he proclaimed referencing his experience trucking cattle. It was Bear-Ayr Burdette Ray exhibited by Peter Vail and Mike and Linda Hellenbrand from Cross Plains, Wis., that claimed reserve honors of the Ayrshire Show for the second year in a row. For the third year in a row, Cedarcut Burdette Clove Colata rose to the top of the International Junior Ayrshire Show. 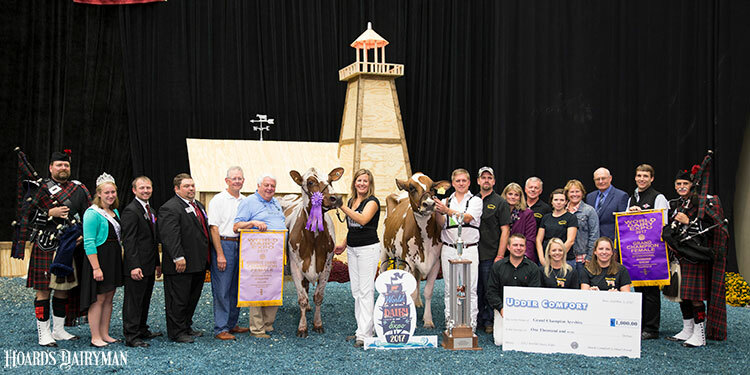 The 5-year-old homebred cow exhibited by Erin Curtis Szalach of Cazenovia, N.Y. also notched honorable mention recognition in the open show and Reserve Senior Champion. The reserve champion of the International Junior Ayrshire Show was the homebred Four-Hills Abush Sammy 3559. Hailing from Bristol, Vt., the 6-year-old cow was exhibited by Britney & Bradley Hill. In the heifer show, it was a Wisconsin and spring yearling sweep. Old-N-Lazy Gentle Wipeout-ET exhibited by Peter Vail, Mike and Linda Hellenbrand, of Cross Plains, Wis., and Frank and Diane Borba of Modesto, Calif., that took the Junior Champion banner while her classmate Marilie Reality Mellini-ET exhibited Brady McConnell of Whitewater, Wis. was reserve. Sweet-Pepper Predator Shale leased by Kylie Jordan and owned by Craig and Bonnie Hawksley of Hope Valley, R.I. came away with the Junior Champion title in the Junior Show. Nor-Bert Reinholts Anique exhibited by the Reinholt and Freeman families of Bremen, Ind. was named the Reserve Junior Champion.